An endless knot motif decorates the top of the box, representing the interrelatedness of all things. Find a quiet place. Set the bowl on its pad. Take a calming breath and gently strike the edge of the bowl with the wooden baton. Relax, focus on the resonating sound, and bring your awareness to the present. Continue to concentrate as the sound gently subsides. Rest in the tranquil moment that follows. Repeat as needed! This handcast bowl is carefully made by artisans in Nepal. 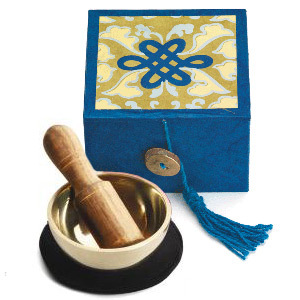 It is hand tuned for clarity of sound but not intended for use as a traditional singing bowl. 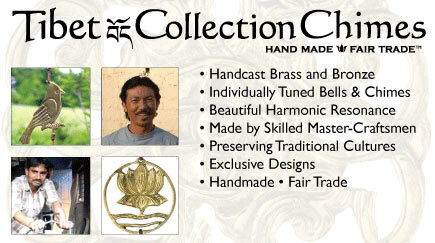 We sourced the Tibet Collection line from dZi, a founding member of the Fair Trade Federation (FTF). dZi is committed to creating innovative trans-cultural experiences. dZi works directly with Tibetan, Indian and Nepalese artisans to create designs that respectfully celebrate the beauty and culture of Tibet. They strive to create ethical relationships and promote better wages and working conditions for the artisans and people who produce our products.